E-Car Club Ltd (‘E-Car’) is a car club that enables private and business users (‘Members’) to book and use all-electric vehicles (‘vehicle[s]’) for periods ranging from one hour to one day or more. Joining us as a Member for either the single, one-off Membership Fee or our Subscription Membership Fees (each explained in the Tariff Guide under Appendix 1 of this document) means access to our low cost travel option when you need it. The information contained in this website is for general information purposes only. The information is provided by E-Car Club and while we endeavour to keep the information up to date and correct, we make no representations or warranties of any kind, express or implied, about the completeness, accuracy, reliability, suitability or availability with respect to the website or the information, products, services, or related graphics contained on the website for any purpose. Any reliance you place on such information is therefore strictly at your own risk. Through this website you are able to link to other websites which are not under the control of E-Car Club. We have no control over the nature, content and availability of those sites. The inclusion of any links does not necessarily imply a recommendation or endorse the views expressed within them. Every effort is made to keep the website up and running smoothly. However, E-Car Club takes no responsibility for, and will not be liable for, the website being temporarily unavailable due to technical issues beyond our control. This website and its content is copyright of E-Car Club – © E-Car Club 2012. All rights reserved. E-Car Club is committed to making resources and services accessible to as many of our users as possible and, where practicable any users with disabilities who need them. The design and construction of this site has therefore taken into account current accessibility standards at the time of development. E-Car is a private limited company that is registered in England and Wales under company number 7789666. Its registered office address and main place of business is at Ubeeqo, Rocketspace, 40 Islington High Street, London, N1 8EQ. 1.1 This document sets out the terms and conditions that will govern the vehicle-sharing relationship that will exist between E-Car (or “us”, or “we”) and a person who takes out membership (‘Membership’) and becomes one of our members (‘Member’ or ‘you’). If any conflicts arise between any of the documents comprising the Contract then, subject to section 1.6 below, these terms and conditions will take precedence. you unreservedly accept and agree to comply with these terms and conditions. 1.4 We remain the owner of all vehicles and any item we provide to, or put at, a Member’s disposal under a Contract including specifically, and without limitation, the RFID smart-card which also acts as your membership card (“Membership Card”). Your use of and rights in relation to any vehicle or such other items we provide are limited to those rights of use stated in these terms and conditions. 1.5 We reserve the right to change these terms and conditions from time to time. We will give you notice of any changes in a timely manner either via our website home page or by email to the address you provided to us either in your Membership application or when updating your Membership details. If you are a Member and you write to us at info@ecarclub.co.uk we will email you the notice of amended terms and conditions. You agree that any amended terms and conditions and/or its appendices will take effect and be binding upon you on the effective date indicated in the notice unless you terminate your Membership within 14 days of receiving the notice from us. If you have any questions regarding these terms and conditions or the Contract generally please contact us via email at info@ecarclub.co.uk or by telephone at +44 (0) 20 3603 2259. 1.6 If you are a company or corporate organisation for which a Service Agreement and/ or credit account has been created then the contractual documents forming the Contract between us (as defined under Section 2 above) must be read in conjunction with that Service Agreement . In the event there are any inconsistencies between the documents then the provisions of the Service Agreement will prevail. 2.1.1 To be eligible to drive one of our vehicles you must first become an E-Car Club Member. Members fall into the categories of ‘Primary & Secondary Members’. Primary Members are responsible for paying any fees or additional charges associated with Membership for and on behalf of Primary and Secondary Members. These include Membership fees, usage fees and Subscription Membership fees or any applicable additional fees or charges as detailed in the Tariff Guide under Appendix 1. Business Account Holders (see Section 3 below) are considered to be Primary Members. Secondary Members are those who have been approved by us and the Primary Member to use our services. Business Members (who are employees of Business Account Holders) will be included in this group. Additional charges may apply for Secondary Members and these will be the responsibility of the Primary Member. Full details of all fees and additional charges can be found in the Tariff Guide set out in Appendix 1 to these terms and conditions. 2.1.2 Application for Membership will be made online on our website at https://ecarclub.co.uk/sign-up/ and it should be completed fully, accurately and truthfully. You should supply all information and any documents that are requested. All applications will be subject to the eligibility requirements set out in sections 2 and 2.3 below. 2.1.3 Membership will be refused to any person who provides us with false information or whose representations are determined to be false (specifically regarding, but without limitation, name, age, address, driving license details or occupation) and to any person who cannot provide valid identification documents when requested or fails our identity verification. Only Members (either Primary or Secondary Members) are permitted to drive our vehicles. All Members (whether Primary or Secondary Members) may drive any vehicle that has been Booked by another Primary Member. However, all fees and additional charges will be the full responsibility of the Primary Member that made the Booking. Any Member that allows a non-Member to drive one of our vehicles is considered to be in breach of these terms and conditions and responsible for any consequences that may arise. This will include, but is not limited to, any traffic offences, compensation for any damage caused by the Member and/or the non-Member driver. The Membership may also be immediately suspended or terminated as a result of allowing any non-Member to drive a vehicle. have no more than 6 Penalty Points on their driving licence. supply all information and documents requested including, without limitation, a “Share Driving Licence” one time passcode to enable us to check your driving licence with the DVLA (either through a three-way call between you and us and the DVLA, and/or using the DVLA online service). Overseas licenses themselves must be clearly identifiable as a driving license and information on it must be capable of being read and understood by English speakers otherwise an international driving license will be required. Driving Licenses that are only valid in the country of issue will mean an international driving license will be required together with other forms of identification as we may reasonably request. These will include, your passport and/or ID card, and either contact details within the UK and/or a utility bill. 2.2.3 If your licence is suspended or revoked for whatever reason or if you receive any further endorsements on your driving record, or if you are convicted of driving under the influence of alcohol or drugs, dangerous driving or exceeding the relevant speed limit then you agree to notify us of such events to us promptly. If you fail to notify us of any such events you may not being covered by our insurance policy when driving any vehicle. As well as a Driving License check we will need to verify your identity and home address before you can become a Member. 2.3.1 If you live in the UK we may use an “Equifax eIDVerifier” checking system to verify your identity. Depending on the results of this check we may need you to provide paper-based proof of identity (such as a utility bill or bank statement that shows your home address) that is less than 3 months old on the date we make the initial identity check. 2.3.2 If you live outside the UK when you apply for Membership we may ask for another form of evidence to verify your identity. This will include your passport and contact details within the UK and/or a utility bill. 3.2 A ‘Business Member’ is a person employed by the Business Account Holder and therefore entitled under the provisions of the Service Agreement and these terms and conditions to drive our vehicles. A Business Member is also a Secondary Member. 3.3 Business Accounts may be subject to different pricing structures and contractual terms. If these are not otherwise set out in the Service Agreement then all prices, procedures and processes will be as outlined in these terms and conditions and in the Tariff Guide set out in Appendix 1. 3.4 The Business Account Holder warrants that, when using the vehicles and services, Business Members will at all times comply with the provisions of these terms and conditions and/or the Service Agreement. The Business Account Holder accepts liability for any costs, claims, loss or damage arising out of or in connection with the Business Members use of the vehicles and the services. 3.5 The Business Account Holder will communicate to Business Members any changes to these terms and conditions. 3.6 The Business Account Holder must inform us immediately a Business Member leaves the organisation. In such a case the Business Account Holder must return the Business Member’s Membership Card to us. Failure to do this will render the Business Account Holder liable for any costs or charges arising or incurred by us as a result. We have specific obligations towards the vehicles that we make available for your use. These are briefly set out below but can be found in more detail within Sections 11 (Damage to the Vehicle/Fair Wear and Tear Policy), 12 (Maintenance and Cleanliness of Vehicles) and 13 (Mechanical Breakdown or Accident). 4.1.1 We will ensure, as far as is reasonably possible, that the vehicle is provided in a roadworthy condition, regularly serviced and with full breakdown cover. 4.1.2 We will make weekly routine inspections of the vehicle condition when we will check things like the windscreen washer fluid, tyre pressures and the battery charge. 4.1.3 Vehicles are made available to you from designated parking bays (or “hubs”) from the Booked start time and are accessed using the Membership Card we have supplied which is unique to you. 4.1.4 In the event of a vehicle breakdown occurring and assistance being requested, a designated breakdown service provider will attend to the vehicle. Where it is not possible to repair the vehicle at the roadside it will be towed to a local repair centre or back to its hub. Wherever possible, and provided you have not run out of charge or been negligent in your use of the vehicle, we will make reasonable onward travel arrangements for you or return you to the hub location. Carry your Membership Card with you as you will need it to lock and unlock a vehicle. Please note that your Membership Card is an RFID card that is unique to you. The cost of replacing lost, stolen or damaged Membership Cards is set out in the Tariff Guide under Appendix 1.
drive the vehicle according to all applicable road traffic laws and regulations. Ensure that you are familiar with all relevant local laws and driving regulations. follow the instructions in the Membership handbook that is in the vehicle. If a problem arises that prevents or limits your use of the vehicle or that may compromise safety you must immediately notify us by phone on +44 (0) 20 3603 2259 and follow the instructions we give you. treat the vehicle with due care and respect and ensure it is always locked and protected by its anti-theft devices, when it is unattended, parked or at the end of your Booking. refill the vehicle with the correct type of fuel (if using a non-electric vehicle). If the incorrect fuel is added then you will be responsible for all reasonable expenses incurred by us in the repair of any damage that may be caused to the vehicle which will be calculated in accordance with the rules described in section 11 (Damage to the Vehicle/ Fair Wear and Tear Policy) below. report stolen vehicles to the police immediately and return the Membership Card to us as proof that you had the Membership Card in your possession when the vehicle was stolen. check that you and any third party passengers have not left any personal belongings in the vehicle. Whilst we will make reasonable efforts to reunite lost belongings with their owner you (and any passenger (whichever applies)) agree that we shall not be liable for any belongings that may be left in a vehicle. Any items we discover will be held for a maximum period of one month. Belongings not claimed within this period will be disposed of. ensure the vehicle is locked using either the app or your Membership Card. take a vehicle (nor permit our vehicle to be taken) outside of mainland UK, without our prior written consent. drive the vehicle whilst under the influence of alcohol or any drug or medication under the effects of which the operation of a vehicle is prohibited, illegal or not recommended. make any modifications to the vehicle without our consent. This includes but is not limited to; the fitting of roof/ bike racks, tow bars or snow tyres/chains. Even if we give our consent you will still be responsible for any damage caused to the vehicle by the modifications. smoke in the vehicle or allow anyone else to do so. Smoking in any of our vehicles is illegal and therefore strictly prohibited. If we reasonably believe that smoking in the vehicle has occurred, you may be liable to pay our reasonable cleaning fees (the costs for which are set out in the Tariff Guide under Appendix 1). We reserve the right to revoke your Membership for repeated incidences of smoking in a vehicle. carry pets unless they are transported in a locked pet carrier. You will be responsible for the removal of any residual pet hair. If any evidence of pet hair is found then additional charges may apply. Assistance animals required by Members or their passengers are allowed in the vehicle without a pet carrier, however, you should put a note in the comments box when you make the booking and ensure the vehicle is left clean. 4.2.4 You must not allow any non-Member or other unauthorised driver to drive the Vehicle which includes you deliberately allowing the non-Member or other unauthorised driver access to the vehicle or the access being acquired due to your negligence, negligent act or failure to act. If you fail to fulfil any or all of these obligations then, it may cause the insurance provisions (set out in section 15.1 below) to be compromised and/or invalidated and you will be responsible for and will pay to us all reasonable costs of any detrimental consequences, loss and/ or damage that may arise as a result. 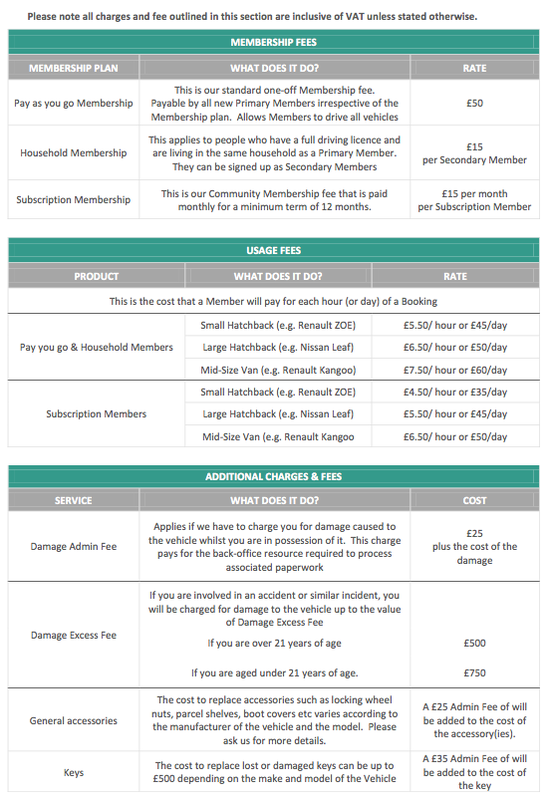 Membership categories and fees are set out in the Tariff Guide attached to these terms and conditions at Appendix 1 and are also available on our website pricing page at https://ecarclub.co.uk/pricing/. Usage fees will be confirmed at the time of Booking. When using one of our non-electric vehicles, you as the member are responsible for the cost of the fuel you use, which will be applied to your booking as a mileage fee. The mileage is billed on a per mile basis at a cost of up to £0.20 per mile (updated quarterly subject to the cost of fuel). The mileage fee is dependent on the vehicle you are hiring. You are required to fill up the vehicle with the appropriate fuel and at the end of your booking, ensure that the vehicle is left with more than a quarter tank of fuel. We provide you a fuel card within the vehicle for the purpose of refuelling non-electric vehicles. If the fuel card is missing or not functioning, E-Car will reimburse you for the actual cost of fuel if you pay for it yourself in accordance with Section 5 of Schedule 1: Club Rules. Members must, when returning the vehicle, ensure that the tank is at least one quarter full; you will be charged a fee in accordance with the Additional Charges Schedule if the vehicle is returned with less than one quarter of a tank of fuel. Any fuel card supplied in our vehicles may only be used to fuel our E-Car vehicles. Members must ensure that they use the correct fuel when refuelling the vehicle (petrol or diesel). Fuel decontamination costs and any other damage or costs (including road side assistance or recovery) arising from the use of the incorrect fuel are not limited to the Damage Excess Fee and are not covered by E-Car’s insurance. a breach of any parking restrictions or a road traffic offence or any other offence or infringement involving the vehicle such as (but not limited to) London Congestion Charge, lane infringement; tunnel, turning and bus lane charges including the costs from the vehicle being clamped, seized or towed away and any other charges/costs (or failure to pay them) levied by a relevant organisation or issuing authority. You are and will remain primarily liable for such charges and you consent to us notifying such organisations of your personal details to effect a transfer of liability. we will tell you that we intend to take the money for the cost of the penalty and the administration fee from your credit/debit card within 14 days of the date of our letter unless you write to us with a legitimate reason why the fine or penalty should not have been paid. If you do contact us with a legitimate reason as to why the fine or penalty should not be paid then we will put this to the issuing authority. If the issuing authority refuses your appeal then we will confirm this to you and then take the money for the cost of the penalty and the administration fee from your credit/debit card. If the issuing authority allows the appeal and you can provide supporting evidence to show that the issuing authority has rescinded the fine or penalty then we will not take any money from your credit/debit card. all Membership and Subscription fees (if applicable to your driving plan); Please note that Membership fees are not refundable. any costs, fees or additional charges incurred by Secondary Members. value added tax (VAT) at the prevailing rate and all other taxes and levies on any of the fees, costs and charges listed in the Tariff Guide that are applicable. if we use a third party to collect the overdue amount you will be liable for any fees or costs associated with those collection activities plus the unpaid charges admin fee shown in the Tariff Guide. 5.2.3 For all debit or credit card payments a pre-authorisation may be requested up to 24 hours before your reservation time to cover the cost of your booking and any additional charges (up to £60). 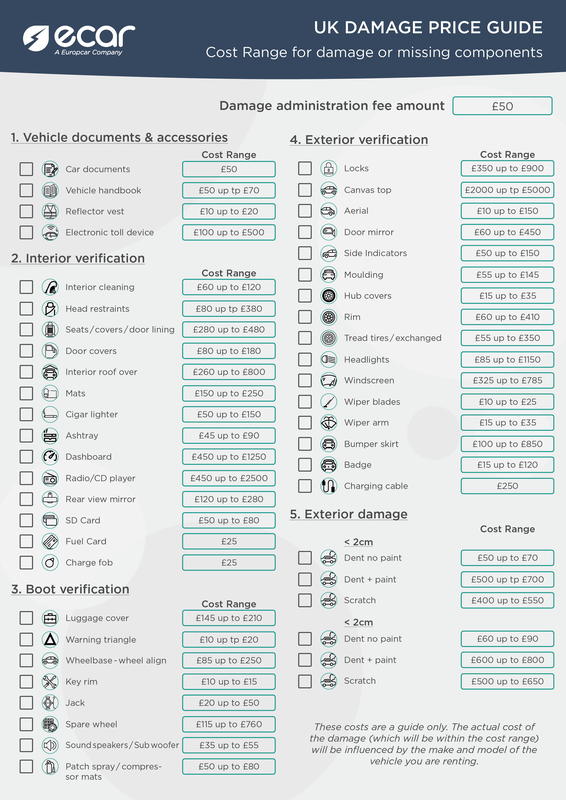 7.1 Vehicles must be Booked either via the internet https://ecarclub.co.uk/login-next or by phone as detailed on our website. You can also use this phone number for general enquiries during normal working hours. 7.1.1 Whilst we cannot guarantee to meet all your Booking requirements we will endeavour to offer a suitable alternative. 7.1.2 The minimum period for which a vehicle can be Booked is one hour. Use of a vehicle for a period longer than one week may be arranged at our discretion and Bookings must be made by email or telephone with one of our representatives. 7.1.3 You will be billed for usage fees at the time of Booking. 7.1.4 In situations where your E-Car usage is funded by a third-party (such as a housing developer), you are expected to comply with Fair Use principles. As such E-Car Club reserve the right to cancel bookings of more than 4 consecutive hours and bookings which exceed the threshold of 10 cumulative hours in any calendar month. Bookings that are cancelled within 24 hours of their due start time, or bookings that are unused will count towards this Fair Use threshold. You can modify or cancel your booking at any time (both before and during the actual Booking) by either logging on to your account or calling us directly on +44 (0) 20 3603 2259. The charges and fees described under this section 7.2 and in the Tariff Guide under Appendix 1 may apply. 7.2.1 If a Member wishes to alter a Booking in any way it is imperative it is done either via the website https://ecarclub.co.uk/login-next or by calling us directly on +44 (0) 20 3603 2259 at least 24 hours before the scheduled start time of the Booking. If you wish to cancel a Booking or reduce the Booking period for a vehicle then provided you give us at least 24 hours notice before the scheduled start time of the Booking there will be no associated costs. If you give us less than 24 hours notice before the scheduled start time of the Booking you will be charged the usage fees for the full Booking period. you make the extension request before the scheduled expiry time of your existing Booking. 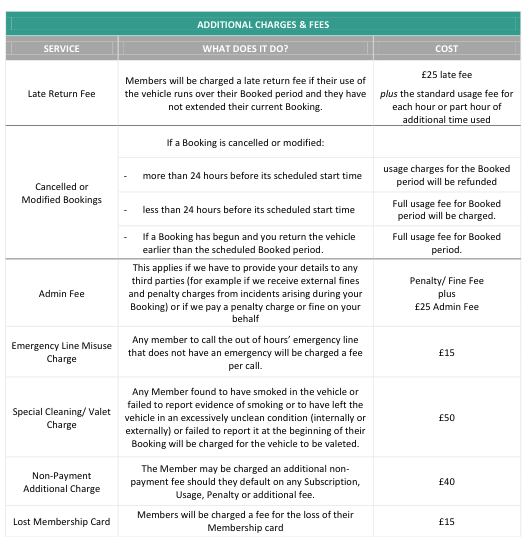 Please note that if you are unable to extend your Booking and you are late in returning the vehicle to its charging point then as well as the hourly usage fee for each hour or part hour of the unauthorised extension period you will be charged the ‘late return fee’ that is set out in the Tariff Guide under Appendix 1 to these terms and conditions. You can also modify your Booking for reasons other than to extend or reduce the Booking period. It may be that you wish to change the vehicle type or location. Provided you give us at least 24 hours notice there will be no charge for this. You must pick up the vehicle at its designated parking space no earlier than your Booked start time. You must assess both the exterior and the interior of the vehicle for damage or other abnormality as well as the charging cable and charging point. Our Fair Wear and Tear Standards are set out in Appendix 2 to these terms and conditions and provide details of how you should measure and assess any damage. secondly by emailing photos and a full description of the damage to info@ecarclub.co.uk. If, during your inspection of the vehicle at the start of your Booking, you notice damage to or a problem with the vehicle (for example a lack of cleanliness) that is not in the vehicle handbook and you don’t notify us of it then you will be deemed responsible when it is discovered or reported later. You may then be charged for the cost to rectify the vehicle (up to the value of the Damage Excess Fee) and we may suspend or terminate your Membership. 8.2 Once you have completed the inspection and gained access to a vehicle you must enter your pin into the reader within the vehicle and remove the keys. When disconnecting the cable from the charging point and vehicle you must take the cable with you by placing it in the boot of the vehicle. 9.1 You must return the vehicle by the agreed time and date to the designated parking bay and in the same condition as it was when you collected it and with all documents and accessories that were present at that time. 9.2.6 the vehicle has been locked using your Membership Card/ the E-Car mobile app. 9.3 You must remove all personal possessions. 10.1.1 We are responsible for the cost of charging the vehicle at its designated parking bay but you will be required to connect it to the charging point at the end of your Booking. The charge card and connection cables will be provided for the purpose. Re-charging cards and cables may only be used by Members to recharge vehicles and for no other purpose. 10.1.2 Instructions for re-charging are provided in each vehicle and you must ensure that you follow the instructions and charge the vehicle correctly. We will charge you for any costs arising from your incorrect use of charging cables and/or the charging point. 10.1.3 When you return the vehicle it is your responsibility to ensure that it is connected to the charging point in the designated parking bay and charging has commenced. If you do not correctly connect the vehicle to the charging point provided, or you fail to connect it at all, then you will continue to be charged the hourly usage fee until the vehicle is connected and charging has commenced. In addition to this you may be charged the loss of use fee that is set out in the Tariff Guide under Appendix 1 to these terms and conditions. For the purposes of this Section 10.2 an “Eligible Expense” is defined as an expense incurred by a Member for minor routine maintenance required by a vehicle during their Booking. 10.2.1 We will reimburse Members for certain Eligible Expenses they incur during the Booking. Such Eligible Expenses may include new windscreen-wiper blades, light bulbs, or windscreen washer fluid. Eligible Expenses that exceed £20 in value must be authorised by us in advance of the expenditure. 10.2.2 If you pay for an Eligible Expense you must keep the original receipt and note on it the odometer reading at the time purchase and your full name. Such receipts should be either posted or scanned and e-mailed to us as soon as possible following expiry of the Booking in question. The cost will then be refunded to your account. No credit will be given without a receipt. All driving and promotional credit given to members will remain on a members’ account for a period of one month; after this point it will expire (unless stated otherwise in writing to the member). 11.1 Any damage caused to the vehicle whilst you have it in your care will be evaluated by us (acting reasonably) and charged according to our cost estimation. Repair costs will vary depending on the extent of the damage. Our Fair Wear and Tear Standards (see Appendix 2 to these terms and conditions) describe how we assess damage and how you should measure, assess and report damage to us. We will charge you for Light Damage according to the Damage Price guide that is included in these terms and conditions at Appendix 3. Serious Damage or other damage that is not viewed as Light Damage because it renders the vehicle unusable or illegal and requires immediate repair before it can be available for Booking by other Members is not included in the Damage Price Guide. Serious or other non-Light Damage will be evaluated by an independent expert and charged according to the expert’s report or to a cost estimate supplied by an independent motor repairer. 11.4 Provided always that you have complied with all local laws and these terms and conditions (and/or the Service Agreement applicable to Business Account Holders) and you have not compromised or invalidated our insurance provisions (see section 1 below) then the amount we will charge you for any Light Damage or Serious or non-Light Damage will not exceed the value of the Damage Excess Amount that was agreed with you at the start of your Membership. However, you may be responsible for all damages and costs arising if you have failed to comply with these terms and conditions (and/or the Service Agreement applicable to Business Account Holders). We will take responsibility for all necessary routine or emergency maintenance on our vehicles as well as cleaning both the interior and exterior on a regular basis. However, you are responsible for the general cleanliness of a vehicle whilst it is in your care, custody and control and you are expected to help to maintain its driving safety and performance by calling us on +44 (0) 20 3603 2259 if you believe that additional maintenance or cleaning is required. You will be charged for the cleaning fee as set out in the Tariff Guide under Appendix 1 to these terms and conditions if you leave a vehicle in an unclean condition at the end of your Booking. 12.2.1 You must respond appropriately to all warning lights and other indicators and alerts. While we will regularly service all vehicles you are expected to assist in routine maintenance (such as but not limited to filling the windscreen washer fluid, changing windscreen wipers and light bulbs and cleaning the interior of the vehicle). The cost of minor maintenance and repairs will generally be an Eligible Expense (see Section 2 above for further details relating to Eligible Expenses). 12.2.2 Unusual noises or driving feel, warning lamps or other indicators and other performance changes must be reported to us as soon as they are noted. Failure to report such irregularities while any vehicle is in your possession may result in the immediate suspension or termination of you Membership. any costs resulting from your negligence (or that of a Secondary Member), including, without limitation, allowing the vehicle’s battery charge to run down to the point that it is incapable of completing the journey. We provide Roadside Assistance support as a part of our service at no additional cost. If, however, your need for Roadside Assistance is the result of a breach of these terms and conditions or a violation of Membership rules then you may be charged for the costs of recovery and/or repair. 13.2.1 All accidents, breakdowns or other similar incidents involving a vehicle must be immediately reported to us by phoning +44 (0) 20 3603 2259. If you don’t do this or you continue to use the vehicle then you will be responsible for any loss and/or damage caused to or resulting from the use of the vehicle or to a third party and for all applicable charges associated with such loss and/or damage together with a damage administration fee for each incident. If you are calling to report an accident or incident outside of standard working hours then you will be given an emergency number to call. This emergency number should not be used for anything other than the reporting of accidents, breakdowns or other similar incidents involving a vehicle. Misuse of this number may result in you being charged the Emergency Line Misuse Charge shown in the Tariff Guide. 13.2.2 We will provide prompt Roadside Assistance anywhere in the United Kingdom. Our primary objective will be to repair the vehicle in situ or at a local repairer. If this is not possible then we will take reasonable action to ensure you are able to continue your journey by other means. This may include arranging a replacement vehicle or covering necessary public transport costs. complete and return the Incident Report Form we provide by email as soon as you have notified us of the incident. photographic evidence of all damage at the scene. 13.2.4 Under some circumstances, and when we instruct you to do so, you may also be required to obtain an official police report and, if possible, provide a jointly agreed-upon statement. 13.2.5 If we ask you to do so you must provide either us, or our agent, with the findings of any report or notice relating to any claim against us relating to an accident or incident involving one of our vehicles. You agree to co-operate fully in any related investigation and the defence we may make to any such claim. 14.1 We collect and process your personal information strictly in accordance with the requirements of the Data Protection Act to the extent necessary to assist us in providing you with our services. 14.2 You have a right to access, rectify and delete the personal information concerning your Membership. You may exercise this right by sending a letter to the following address: The Data Protection Officer, Ubeeqo, Rocketspace, 40 Islington High Street, London, N1 8EQ. 14.3 Any telephone calls and e-mail correspondence you undertake with us may be recorded and/or monitored. By using these forms of communication you are consenting to the recording and/or monitoring of your calls and e-mail. 14.4 By applying for Membership you authorized us to obtain your driver’s records from the DVLA. We may, from time to time, check your driving records and we reserve the right to request additional information such as a copy of a passport or proof of address at any time and/or to suspend or terminate your Membership if you do not continue to meet our eligibility criteria. 14.5.1 To verify your identity; process and collect payment under a Contract, monitor fraud and deal with any issues before, during and after termination of a Booking. 14.5.2 To obtain information from third party agencies before your Membership can be approved for the purposes of checking your identity and that of any potential Secondary Members. This identity check will leave an electronic note or “footprint” on your record but will not affect your credit rating; it is not used as part of the credit vetting process and the information is not sold to third parties. 14.5.3 We will keep a record of any breach of a Contract, suspected fraud or accident history to help us with future decisions about you and/or any Secondary Member. 14.5.4 We may give your personal details to credit reference agencies, DVLA, HM Revenue & Customs, the police, debt collectors (including solicitors) and any other relevant organization that we consider may have a legitimate need for such information. 14.5.5 Our data protection policy is available from: https://ecarclub.co.uk/privacy-policy/. 14.5.6 Where you have agreed we will use the personal information for marketing purposes such as special promotions and loyalty programs. 15.1.1 Liability to a third party which means other people’s bodily injury or death and / or damage to their property that occurs because of an accident or incident that you cause. Damage to a third party’s property could include a third party’s vehicle and its contents; or a third party’s buildings or its contents; or to machinery or personal possessions. 15.1.2 Damage to or theft of the vehicle. This may be the result of a collision or an attempted theft and it needs to be repaired or it may be so badly damaged that it is irreparable and we write it off; or it may be stolen and not recovered. 15.2 If you are driving the vehicle at the time of a collision and you are responsible for the collision taking place then whilst any injured Passengers will be covered by our Third Party Liability insurance your own death or injuries, together with the possible associated consequences of it, will not. Book value: means the value of the vehicle calculated by an industry recognised system which provides a figure that is the difference between the retail value and the trade value of the vehicle at the time of the incident. Damage Excess amount is a specified sum of money that, provided you have complied with these terms and conditions and have not committed a breach of any applicable laws, is the maximum amount we will charge you for the cost of any damage caused to the vehicle as a result of a collision or its attempted theft during the Booking; or the loss of a vehicle if it is written off because it is irreparable or if it is stolen and we do not get it back. The Damage Excess amount is a non-waivable sum that was agreed at the time you took out your Membership. Third Party Liability insurance means insurance that provides protection against liability for another party’s claims for damage to his/her property or for bodily injury or death arising out of an incident that occurs whilst you are driving a vehicle. Third Party Cover is a mandatory legal requirement and it is therefore an integral part of our service. We are required by law to insure our vehicles against liability for the claims or actions of Third Parties. It is automatically included as part of your usage fees. You will therefore, as a matter of course, be covered up to the level legally required for the consequences others may suffer as a direct result of your actions whilst you are driving the vehicle. 15.3.3 What is the amount of your financial exposure for Third Party Liability? You are covered for the financial cost of any Third Party Liability arising as the result of a collision that you may cause up to the legally required level. However, if you committed a breach of any applicable laws (including any relevant road traffic regulations) or these terms and conditions then, whilst our insurer will still fulfil its obligations to Third Parties under the Third Party Liability insurance policy, it may seek to recover from you some or all of the costs it may have paid to that Third Party as a result of the incident. 15.3.4 How to notify us? In circumstances involving Third Parties it is important that you do your utmost to report the collision to us at the earliest possible opportunity providing full details of both the incident and of the Third Party. Section 13.2 above gives full details of what is required to enable us to defend our case against the Third Party (if you are responsible for the incident) or recover costs from the Third Party (if the Third Party is responsible for the incident). Our collision damage Protection limits your financial exposure for damage caused to the vehicle whilst it is in your care. If you comply with the applicable laws and these terms and conditions then we will pay for the cost of vehicle damage that exceeds the Damage Excess amount. Collision damage Protection does not cover the loss or theft of or damage to objects or property, (including luggage or goods) that are deposited or kept or transported in or on the vehicle by you or by any of your Passengers. notify us immediately with full details of the accident or incident according to the provisions of section 2 above. 15.4.4 What will your liability be? Provided you have complied with these terms and conditions and the applicable law and road traffic regulations then the maximum you will have to pay us is the Damage Excess amount. Our theft Protection limits your financial exposure for loss of the vehicle if it is stolen or if it is damaged because it is subject to an attempted theft or the vehicle is subject to an act of vandalism during the Booking. Provided you have complied with these terms and conditions, we will pay for the costs arising from the theft, attempted theft, or act of vandalism that are greater than the Damage Excess amount. Theft of or damage to personal and / or work related goods or possessions and any goods being transported in or on the vehicle. notify the local police of any incident or event immediately or as soon as is reasonably practicable and provide us with the police report or evidence that the theft has been notified to the police. Notify us of the theft within 24 hours of the time you discover the vehicle is missing and return the keys to us. 15.5.4 What will your liability be? If, during your Booking, the vehicle is stolen or is damaged in an attempted theft or due to vandalism then, provided you have complied with these terms and conditions, the maximum you will have to pay us is the Damage Excess amount. 16.1.1 If we are in breach of a Contract we will not be responsible for any losses (including any loss of profits, loss of business, business interruption, or loss of business opportunity) or damages that are not foreseeable. losses or damages which are a foreseeable consequence of our breach of this Contract or our negligence up to a maximum value of your usage fees for the Booking. Loss or damage is foreseeable if it is obvious that it will happen or if, at the time the Contract was made, both we and you knew it might happen. 17.1.1 Your Membership will commence following our approval of your Membership application form and payment of any Membership or Subscription fees. Membership for Subscription Members will continue for a minimum period of 12 months. 17.1.2 Membership will continue until is terminated by one party in accordance with this Section 17. 17.2.1 You may terminate Membership and all associated Secondary Memberships by giving us one day’s notice by phoning +44 (0) 20 3603 2259 and confirming by email to info@ecarclub.co.uk. Any Subscription fees detailed in the Tariff Guide under Appendix 1 will remain due and payable for the minimum term (see section 1.1 above). becomes insolvent, files or has filed against it any document under any bankruptcy or insolvency law or similar law, or proposes any dissolution, liquidation or financial reorganization with creditors. is involved in an accident which, in our reasonable opinion, renders the Member ineligible or inappropriate for continued Membership. The Subscription fees detailed in the Tariff Guide under Appendix 1 will remain due and payable for the minimum term. to take full responsibility for paying any legal fees, court costs or expenses associated with enforcing the terms of Membership or any Contract whether upon termination or otherwise. 17.3.1 If you are a consumer we may end a Contract immediately if we discover that any of your belongings have been taken away from you to pay off your debts, or a receiving order has been made against you or steps have been taken to make you bankrupt or for you to enter into an individual voluntary arrangement. 17.3.2 If you are a Business Account Holder we may end a Contract immediately if you go into any form of insolvency or you call a meeting of creditors or we discover that any of your goods have been taken away from you to pay off your debts or receive adverse information or fraudulent financial information. 17.3.4 If a Contract ends it will not affect our rights under the Contract including the right to receive and/or claim any amounts which you owe to us under the Contract. 17.3.5 If you end a Contract after you have collected the vehicle you must return the vehicle to us. If you are ending a Contract because we have told you of an error or change in pricing or description or because you are exercising your legal rights to end the Contract because of something we have done wrong then we will pay the costs of return. In case of any dispute regarding your Booking, the applicable law will be English law and subject to the jurisdiction of the English courts. if you prefer, you can write to us in the UK at E-Car Club, Ubeeqo, Rocketspace, 40 Islington High Street, London, N1 8EQ. 18.2.2 Whether you call us or write to us we’ll aim to respond to your query or complaint within 5 working days of receiving your communication. If we can’t respond in these timescales, we’ll tell you why and let you know when we aim to reply to you. 18.2.3 If we have to contact you we will do so by telephone or by writing to you at the email address or postal address you provided to us at the time of your Booking. 18.2.4 We are under a legal duty to provide vehicles that are in conformity with the Contract. Nothing in these terms and conditions will affect your legal rights or remedies. For detailed information please visit the Citizens Advice website (www.adviceguide.org.uk). All notifications that need to be served on either you or us in regard to your Booking will be sent to the address indicated in the Booking unless either of us notifies the other party to the contrary. 18.4 Code of Conduct applicable to the vehicle rental industry? 18.4.1 Leaseurope has published a code of conduct for the car rental industry. You may obtain a copy at the following address: leaseurope.org. a breach of any parking restrictions or a road traffic offence or any other offence or infringement involving the Vehicle such as (but not limited to) lane infringement, tunnel, turning and bus lane charges including the costs from the Vehicle being clamped, seized or towed away and any other charges/costs (or failure to pay them) levied by a relevant organisation or issuing authority. You are and will remain primarily liable for such charges and you consent to us notifying such organisations of your personal details to affect a transfer of liability. If we are required to deal with such correspondence, we will charge your credit/ debit card for our Third-Party Administration Charge as set out in the Tariff Guide. You have the right to challenge that Third-Party Administration Charge within 14 days of the date of the invoice. The Third-Party Administration Charge will only be refunded if you can provide supporting evidence to show that the issuing authority. confirms that the original charge did not apply in any event. 19.1.2. If we receive a penalty charge notice that is issued for the Vehicle during your Hire Period and which is capable of being paid then we may pay it so that we mitigate the cost of it. we will tell you that we intend to take the money for the cost of the penalty and the Third Party Administration Charge from your credit/debit card within 14 days of the date of our letter unless you write to us with a legitimate reason why the fine or penalty should not have been paid. If you do contact us with a legitimate reason as to why the fine or penalty should not be paid then we will put this to the issuing authority. If the issuing authority refuses your appeal then we will confirm this to you and then take the money for the cost of the penalty and the Third Party Administration Charge from your credit/ debit card. If the issuing authority allows the appeal and both rescinds the fine or penalty and confirms to us that the original charge did not apply in any event then we will not take any money from your credit/debit card. What are my obligations towards the vehicle? 20.1.3. in the condition that we provided them to you at the start of the Hire Period, subject to any fair wear and tear. For a definition of fair wear and tear please refer to our ‘Guide to a Smooth Journey’ which can be found on http://www.europcar.co.uk at the foot of the Home page. If you do not return the Vehicle as stipulated in this section 5.1 then we will take all necessary measures outlined in these T&Cs and, in particular, in its section 11 (What will happen when I return the Vehicle?). 20.2. Never drive the Vehicle outside the Territory (see section 3.1 above) without our prior written consent. Moreover, if we do consent then, it is for you to ascertain that the Vehicle has the correct equipment to comply with the local driving regulations of the country that you will be driving in or passing through. 20.3 Drive the Vehicle in accordance with all applicable road traffic laws and regulations and ensure that you are familiar with all relevant local laws and driving regulations. 20.4 Ensure that any luggage or goods transported in the Vehicle are secured to the extent they will not cause damage to the Vehicle or cause risk to any passengers or to any third party or to any third party property. 20.5 Treat the Vehicle with due care and respect and make sure that it is always locked and protected by its anti-theft devices when it is parked or left unattended. 20.6 Never drive the Vehicle whilst you are under the influence of alcohol, hallucinatory drugs, narcotics, barbiturates, other illegal drugs or any other substance (whether legal or illegal) that is liable to impair your driving ability. 20.7 Not fit any roof or bike rack or any tow bar nor allow anyone else to do so. If these are already fitted you must not (nor allow anyone to) modify them. You must not fit winter tyres (nor allow anyone to do so) or make any other modifications to the Vehicle without our prior written consent. You will be responsible (even if we give consent) for any damage caused by the fitting of winter tyres or subsequent exchange to normal tyres or for any other modification. 20.8 Not smoke in the Vehicle nor allow anybody else to do so. If we reasonably think that smoking has happened in the Vehicle you must pay our Special cleaning / valet charge which is described in section 9 (What are the other fees / charges that I may have to pay?) below. 20.9 Refill the Vehicle with the correct type of fuel. If unsuitable fuel is added then you will be responsible for all reasonable expenses incurred by us in the repair of any damage that may be caused to the Vehicle which will be calculated in accordance with the rules described in section 21 below. 20.10 Make routine inspections in respect of the Vehicle condition: for example, oil and water and coolant levels, front and rear windscreen washer fluid and tyre pressures and take any preventive actions necessary to keep the Vehicle in good working order. 20.11.10. to intentionally commit an offence. 21.1 As set out in section 5 (What are my obligations toward the Vehicle?) and, in particular section 5.1, you are obliged to return your Vehicle and its keys, Accessories, or documentation to us in the same condition as they were at check out, subject to any fair wear and tear. 21.3.2. the Excess amount under our Protection packages whichever is the lower amount. 21.4 If you contest the damage and/or the invoice by refusing to sign the statement of return for the Vehicle, or where the charge cannot be determined at the time of check-in, then we will send you the documents outlined in section 21.5 and you have the option to follow the procedure in section 21.6 below. 21.5.3. an invoice detailing the applicable charges. 21.6.2. the Excess amount under our Protection packages whichever is the lower amount. 21.7. Please note that depending upon the type of Protection product you have subscribed to and provided you have complied with all applicable local laws and these T&Cs you may not be charged for the full cost of the damage and the maximum amount you may be required to pay will be the Excess amount (as described in Europcar Insurance & Protections Provisions). 21.8. Any minor damage to the Vehicle (or the loss of (or damage to) the Vehicle’s keys, Accessories, or documentation) which is listed in our Light Damage Charges Schedule is classified as ‘Light Damage’. Examples of Light Damage to the Vehicle include small scratches, chips or dents to any part of the Vehicle (including certain repairs to the windscreen and tyres, as listed in the Light Damage Charges Schedule which can be found on the home page of the Europcar website: www.europcar.co.uk. 21.9. Where the Vehicle has suffered Light Damage, notwithstanding your obligations to us under section 5 above, this means the Vehicle does not necessarily require immediate repair for safety or cosmetic reasons before it can be rented to another customer. 21.10.2. a Light Damage Administration Charge which is set out in the Tariff Guide. 21.11. The pre-agreed fixed sums(s) in the Light Damage Charges Schedule are set by us at an amount that seeks genuinely to estimate the sums that we would have to pay our suppliers to repair the Light Damage (or to replace the Vehicle’s keys, Accessories, or documentation). In the case of Light Damage you will have the certainty of paying a pre-agreed fixed sum and you will not pay a Loss of Use Charge or a separate Engineer’s Charge. 21.12. Any damage to the tyre which requires us to replace the tyre on the Vehicle with a new tyre that is listed in our Tyre Charges Schedule (which can be found on the home page of our website: www.europcar.co.uk) is classified as a ‘Tyre Replacement’. 21.13.2. a Light Damage Administration Charge which is set out in the Tariff Guide. 21.14. The pre-agreed fixed sums(s) in the Tyre Charges Schedule are set by us at an amount that seeks genuinely to estimate the sums that we would have to pay our suppliers to replace the tyre. In the case of a Tyre Replacement you will have the certainty of paying a pre-agreed fixed sum and you will not pay a Loss of Use Charge or a separate Engineer’s Charge. 21.15. Subject to section 21.18, any damage other than Light Damage to the Vehicle or a Tyre Replacement is classified as ‘Serious Damage’. 21.16.2.3. a Damage Administration Charge which is set out in the Tariff Guide. 21.17.2. you will not receive any credit to reflect the benefit that we may subsequently receive in the context of any commercial arrangements that we may have in place with our suppliers because of our overall relationship with them (including its size). 21.18.2.3. a Damage Administration Charge which is set out in the Tariff Guide. 21.19. Unless, during the Hire Period, your Vehicle is covered by one of our Protection packages (which automatically includes third party liability insurance) you will be responsible for the cost of any damage you cause to another party, their property, the vehicle they are in and any and all uninsured losses that are otherwise incurred during the Hire Period. 21.20.3. a Loss of Use Charge to compensate us while we cannot rent the Vehicle out to another customer (which will be calculated on the basis of the daily rental rate set out in the Rental Agreement for each day (or part of a day) in excess of the Hire Period and until the Vehicle is checked in by us as returned) unless these damages or costs or Loss of Use Charges are due to our fault or negligence or our breach of this Contract. In order for us to ensure we offer a high level of vehicle standards to all our Members the following Fair Wear and Tear standards are designed to ensure you are aware of what is an acceptable standard. Any defects you find outside these Fair & Wear Standards is defined as damage. Before taking possession of any vehicle all Members must assess both the outside and inside of the vehicle, as well as the charging cable and charging point. Any previously unreported damage you find during this initial assessment must be reported immediately to the customer relations team by calling on 44 (0) 20 3603 2259 and emailing photos and description of the damage to info@ecarclub.co.uk. If you do not notify us of any damage or defect at the start of your Booking, then we will hold you responsible for any problem with the vehicle which is discovered or reported during your Booking or after it expires. Small glass chips (under 5 mm) are acceptable on windscreens and headlamps; however, you should check windows and light lenses for cracks, scratches or large chips. All vehicles are regularly checked and maintained; however, any mechanical faults should be reported immediately to avoid further unnecessary damage. Tyres should have no obvious damage caused through kerbing or abuse. Cuts and gouged rubber to tyre side walls is not acceptable. Wheel rim and wheel trim scuffing over 40mm (total area), main wheel body scuffing or wheel distortion is also not acceptable. All standard equipment must be present with the vehicle. Examples of items to check for: in car entertainment system, aerial, headrests, trim items etc. 1.1 What is personal information? Personal information means information that identifies you as an individual, or that we can combine with readily available information to identify you as an individual. 1.2 What personal information we collect and how we use it The principle purposes for which we collect and store your personal and financial information are to process your application, allow you to reserve and use our vehicles, authorize payment, bill you, respond to your inquiries, improve our products and services and maintain your account with us. 2.1 Your personal details will be collected and processed when you visit the E-Car Club website or use any of our digital applications (such as your iPhone or iPad applications), our servers automatically log certain information about your use of our websites, such as your browser type, browser language, IP address, operating system and service provider. We also collect website and application usage information; this might be the pages that you visit or the ads or links you click on. The first time you visit the E-Car Club website, E-Car Club assigns you a unique number, which is stored in one or more cookies on your computer’s hard drive. If you have joined E-Car Club or provided other personal information about yourself (for example, if you send us an email) your cookie ID can be associated with you personally. 2.2 What is a cookie? • building up an anonymous profile based on your browsing patterns across our sites, applications and third party websites, which enables us to make advertisements and content available to you that is more relevant to your interests You can delete cookies from your hard drive at any time. Bear in mind, though, that if you delete them, any settings such as your stored username and password will have to be reset when you next log in. 2.3 E-Car Club collects information that you voluntarily submit to us, such as your name, email address, postal address or telephone number, if you include that information in an email, or text message sent to us or you tell us over the telephone, in an instant message or by other means. Your telephone calls and email correspondence with us may be recorded or monitored for quality control, training and similar purposes. By using these communication methods, you are consenting to the recording or monitoring of your calls and emails with E-Car Club. 2.4 If you apply to join E-Car Club, we collect personal and financial information as you proceed through the stages of our online application, membership agreement and reservation process. In addition to your name and contact information, we will also collect your driver’s license number and the jurisdiction in which you are registered and credit card or other payment information. We may also collect information such as your driving record from regulatory bodies where you live, and from third parties. This information is used to process your application and, if you are approved, for the purposes described below. 2.5 If you join E-Car Club and use our services, we collect information about your reservations (dates, times, locations, etc.) and your use of the E-Car Club service (return time, mileage, accidents, etc.). We use this information to bill you, respond to your inquiries, provide and improve our products and services and maintain your account with us, to personalise your E-Car Club experience (i.e. by understanding your preferences). From time to time we will send newsletter emails. To unsubscribe from our newsletters please use the opt out in the account settings page. 2.6 E-Car Club Cars may be equipped with Global Positioning System (GPS) vehicle tracking technology and an onboard vehicle camera. GPS is a network of satellites that allows us to determine the location (latitude and longitude) of E-Car Clubs. This information is transmitted to E-Car Club and temporarily stored (including while it is hired to you). E-Car Club uses this information for a variety of important purposes. For example, we use GPS data to help you find a car you have reserved, to provide roadside assistance when you need it, to ensure that a car is available at the place and time you have reserved, to alert us when an E-Car is likely to be returned late and to locate lost or stolen E-Car’s. We do not actively track or monitor vehicle location, and we do not store historical GPS data regarding vehicle location – we use GPS data only to determine the last reported location of an E-Car. Where installed, on board vehicle cameras will be used to record driving footage for insurance purposes. In the event of an accident this footage may be reviewed or passed on to the necessary authorities, our insurers or other parties as required and at the sole discretion of the Company. 2.7 Refer a Friend. If you choose to use our referral service to tell a friend about our site, we will ask you for your friend’s name and email address. We will automatically send your friend a one-time email inviting him or her to visit the site. E-Car Club stores this information for the sole purpose of sending this one-time email and tracking the success of our referral program. Your friend may contact us at info@e-carclub.org to request that we remove this information from our database; however, if someone else subsequently refers the same friend, their email address may be stored again. 2.8 Children’s Privacy: We do not knowingly solicit or collect individually identifying information from children under the age of 13. E-Car Club maintains servers within the European Union where your personal information will be safely stored. 4. To what 3rd Parties might we transfer personal information? 4.2 We may disclose your personal information in connection with a corporate transaction, proceeding, or reorganisation involving the business activities for which the information is maintained. In the event that ownership of E-Car Club or its business was to change as a result of a merger, acquisition or transfer to another company, your personal information may be transferred. If such a transfer results in a material change in the way your personal information is used, we will provide notice about the choices you have to decline to permit such a transfer. 4.3 E-Car Club may disclose your personal information, including location/GPS data, in response to legal process (for example, a court order, search warrant or subpoena) or requests from law enforcement authorities; in other circumstances in which E-Car Club believes the website, the E-Car Club service or our vehicles are being or has been used in violation of the applicable law or otherwise in the commission of a crime; when we have a good faith belief that there is an emergency that poses a threat to the safety of you or another person; or when necessary to protect the rights or property of E-Car Club or third parties. 5.1 E-Car Club may use personal information to present offers to you on our behalf and on behalf of business partners, but we do not share information that personally identifies you with those parties. If you do not want us to send you promotional emails, please e-mail us at info@e-carclub.org or opt out at the foot of any such e-mail. 5.3 Cookies are text files that are placed in your computer’s browser, and that can be used to help recognize you on the E-Car Club websites. Web beacons are small pieces of code placed on web pages that can be used, among other things, to count the users who visit that web page, or to deliver a cookie to the browser of a user viewing that page. Many websites, including e-carclub.org, also may use Flash cookies that are similar to regular browser cookies. You can control browser cookies through your browser’s settings. You can control Flash cookies via the Macromedia Flash application on your computer, or by going to the Macromedia Flash Player website, which allows you to view, modify, and delete Flash cookies. You may delete cookies or set your browser to alert you when cookies are being sent. If you reject all browser or flash cookies, however, some areas of our sites may not function. 6. How may I review and correct my personal information? 6.1 E-Car Club is committed to providing you with reasonable and practical access to your information to allow you the opportunity to identify inaccuracies. If you are a member of E-Car Club, you can review and correct personal information by e-mailing members@e-carclub.org or calling us on 020 3603 2259. If you would like to access, delete and/or correct other personal information held by E-Car Club, please contact us in one of the ways provided below and we will respond to your request within 30 days. When commercially practicable, if E-Car Club is informed of the inaccuracy we will make the appropriate corrections. If you are a resident of the United Kingdom, under the Data Protection Act you have the right to request a copy of the personal information we hold about you and have any inaccuracies corrected (we will charge a reasonable fee for such information requests and require you to prove your identity with 2 pieces of approved identification). 6.2 We will retain your information for as long as your account is active or as needed to provide you services. Please contact us if you wish to cancel your account or request that we no longer use your information to provide you services. We will retain and use your information as necessary to comply with our legal obligations, resolve disputes, and enforce our agreements. 7. What security measures are used to protect my personal information? If you have questions about our handling of personal information, you may write to us at info@ecarclub.org or at the address below.